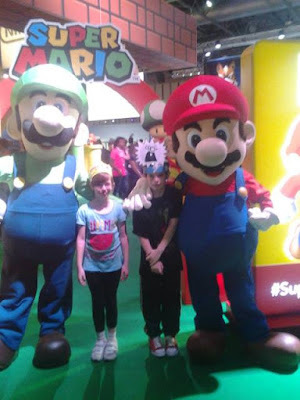 So this weekend saw me and the family take a trip down to Birmingham and take in all that EGX had to offer. After making the trip down to London last year for this event by myself, I was excited to take the kids down this year for their first event after loving it so much the previous year. EGX is without a doubt the biggest event on the UK calender when it comes to gaming events, but this year was nothing on last year. While this year there felt like there was a lot more space to move around in, it certainly came across as an event based more around indie games and YouTube stars than ever before. While big games were there such as Black ops 3, Just Cause 3, and the like, everywhere you looked you were met with either YouTube stars being on some sort of stage or the massive Indie area this year. I'm into neither of these so it did nothing for me at all. In terms of it being held in Birmingham this was actually better for me as I have family down there, but I can't lie and say the event didn't lose a little something not being in the Capital this year. For one the NEC is pretty much in the middle of nowhere, so those lunchtime runs to Nandos and surrounding shops at Earls court were deeply missed. Overall I was a little letdown with the event this year, not just by the lack of big releases there but also it having lost some of its atmosphere. Fingers crossed then that next year it learns from its mistakes.